Every passing day is bringing Salman Khan fans closer to Indian reality television show Bigg Boss season 12. Salman hosted show is notorious for housing celebrities and commoners that ensure that the audiences are entertained to the limit where their bellies hurt by laughing or their eyes hurt by rolling them constantly at the contestants’ antics. Just like the past few seasons this season too will have a bunch of commoners and celebrities living together. And looks like the names of the celebrities who might be staying in the Bigg Boss house has been leaked! However, a lot more has been revealed by ‘Bigg Boss Khabri’. Bigg Boss 12: British Pornstar Danny D And His Partner Mahika Sharma To Be The Highest Paid Jodi Of This Season? Controversial Instagram account ‘Bigg Boss Khabri’ has revealed that the contestants will enter the house solo and will be paired off later with the help of tasks. On contrary to the previous rumour that celebrities will be paired off with fellow celebrities— Bigg Boss Khabri claims that celebrities will be paired off with commoners this season. Now it remains to be seen to what degree will these ‘jodis’ will be joined to the hip? 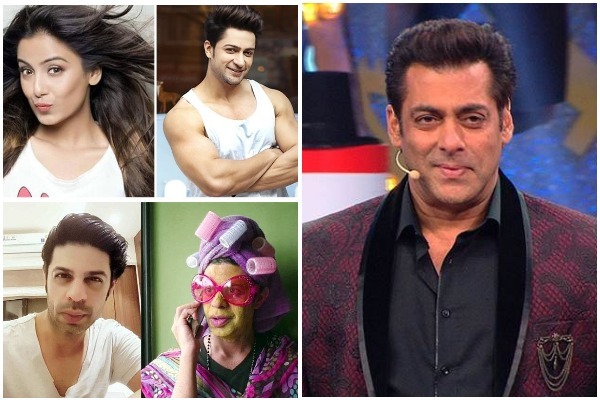 This is not all, Bigg Boss Khabri has also put up a list comprising of the names of 6 celebrities who might participate in Salman Khan’s hosted reality television show this season. Knowing how correct Bigg Boss Khabri has been in the past regarding the credibility of his news, who knows we might see these faces gracing our television screens trough Bigg Boss season 12? Veteran actress of ‘Sapna Babaul Ka… Bidaai’ fame actress Vibha Chibber was supposed to enter the show alongside her model-actor son Puru. However, as per the last-minute changes in the show’s format only Vibha is expected to participate in the show. Every season Bigg Boss has had the tradition of inviting contestants from reality shows Splitsvilla and Roadies. Former contestants of the youth-oriented shows Prince Narula, Benafsha Soonawalla, Priyank Sharma among others have stayed in the Bigg Boss house. So, this season Splitsvilla season 7 winner Scarlett M Rose is expected to enter the Bigg Boss house. As per rumours she will be accompanied by her boyfriend Ryan Peterson. Subuhi Joshi rose to fame post Splitsvilla’s season 8 and will enter the Bigg Boss house this season. Previously, Subuhi was supposed to be accompanied by her comedian boyfriend Siddharth Sagar. However, due to the changes in the show’s format Subuhi Joshi will be entering the house solo. Ishqbaaaz actress Srishty Rode was all set to enter the Bigg Boss house with beau Manish Naggadev. But given the latest changes she will be seen solo during Bigg Boss season 12. Who know who will be paired with her? Popularly known as the ever entertaining Pammi Aunty— comedian and actor Ssumier Pasricha is expected to add masala to Bigg Boss this season. Television actress Dilljiet Kaur’s ‘abusive’ husband Shaleen Bhanot is expected to the show this year. Will he entertain us with his explosive secrets about his failed marriage? We can only wait and see if these 6 celebrities enter the Bigg Boss house this season, thus proving Bigg Boss Khabri’s news true. Salman Khan hosted Bigg Boss season 12 will begin entertaining us from September 16, 2018.